Nasi Lemak is definitely one of the must-try hawker food in Singapore. Like what I’ve mentioned previously, there are a few nasi lemak stalls in Singapore that have platinum status (and perpetually long queues): the famous Changi Village Nasi Lemak, the two rivaling Adam road Nasi Lemak stalls, Fong Seng Nasi Lemak, Chong Pang Nasi Lemak, the popular Boon Lay Power Nasi Lemak, and of course Punngol Nasi Lemak. All of us know that Breakfast is the most important meal of the day. While I usually don’t have a heavy meal in the morning, but on days when I feel like indulging, a plate of good nasi lemak can last me all the way till tea time. When it comes to Nasi Lemak, it is all about the chicken wings, coconut rice, and chilli. While this may not be the healthiest plate of food, it is definitely one of the tastiest. Grab the chicken wing by the tip, and eat it together with the mixture of the fragrant coconut rice and fiery hot sambal chilli – the combination of coconut, spices, and greasy fried food is surely one of life’s precious moment. It’s true when they say that the East of Singapore is a foodie paradise. Where else in Singapore can you see a whole stretch of restaurants and eateries? Starting from Tanjong Katong to East Coast road, and Siglap, the whole East Coast area has food and more food. Punggol Nasi Lemak at Tanjong Katong outlet is located directly opposite With A Pinch of Salt Cafe, and there was a short queue forming when we were there at 5.30pm. Punggol Nasi Lemak is good but not great. I don’t think it’s the best Nasi Lemak in Singapore, but I won’t mind having it if I’m in the area and there’s no long queue. It’s a ideal late night supper place in Singapore for the night-owls, and I must say, the idea of having nasi lemak in the middle of the night is very appealing. What do you usually eat for supper? 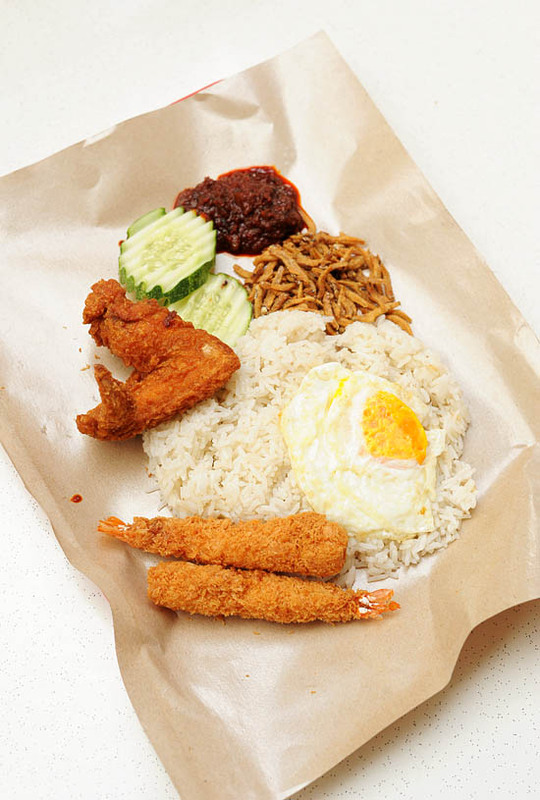 nasi lemak with fried prawns? thats a first for me! If I happen to be at the city area, I will always hit the rochor soya beancurd store for some warm soya drink mixed with soya beancurd and portugese egg tart. If I’m lazy, a cup of cold milk with cornflakes or hot Milo with a few biscuits will do fine. Thanks for this, I’ll definitely try punggol nasi lemak if I happen to be at the east! Which one do you prefer, power or punggol? Battered prawns? Hmm… a fusion twist to nasi lemak, perhaps? My fav nasi lemak is at tanjong pagar foodcentre! $2.50 only and many “liao”.. I have no idea why there is always a crowd at the Upper Serangoon Road Branch. It does not really taste that great and it is expensive. I give my two thumbs up for the Nasi Lemak @ Changi Village. So much better. The only thing missing – peanuts! Must try Shima malay cuisine.Best nasi lemak n mee rebus Ive eaten!01-76 upp boon keng hawker centre. This is the most overrated nasi lemak stall, especially the one at Upper Serangoon. Prices are at least 3-4 times higher, comparing to same non aircon eating house like coffee shop or food centre. You can get better nasi lemak at Lorong Ah Soo food centre at $2.50- $4.00 per plate with variety of chicken wing, egg, fish, ikan bilis, fillet, meat roll, luncheon meat, vegetable etc. Chilli paste is just as good if not better and will generously give more of it if you ask. Only setback is the nasi lemak is too good and sold out by early noon. Even Kovan food centre has good nasi lemak at $2.50 per standard plate. Further away, Tanjong Pagar has one of the cheapest and good nasi lemak. They are lots more good nasi lemak all over Singapore which are much better the Punggol nasi lemak in terms of price, taste, serving, service but not publicise. City plaza food court 5th floor ah weng nasi lemak is also nice MUST TRY!!!!!! Don’t understand the long queue. Thought it must be very good. To my huge disappointment, upon getting my NL, the chilli was burnt.It looked so dark. Not appetizing. What is Nasi Lemak without great tasting chilli? Over-rated and over-priced. We paid about $25 for 4 small plates of NL with minuscule portions of various ingredients. Everything was over fried. The vegetables too. Not worth it. Totally worth it. Cheapstakes, no one needs your business really. Too many cheap @sses in Singapore. If they are poor, at least they have an excuse to NOT like going to Punggol NL stall. If you guys have not tried Bali Nasi Lemak @ Lorong 15 Geylang. You have NOT taste the real authentic Nasi Lemak. Their signature dish, Kechap Manis (Black Chicken Wing) is the main event here. I agree that Punggol Nasi Lemak and the rest like Boon Lay Power is good but its nothing compared to Bali Nasi Lemak. Try it. And let your taste bud do the talking.